In this document, learn how to deploy your model as a web service in the Azure cloud, or to IoT Edge devices. Azure Kubernetes Service (AKS) Real-time inference Good for high-scale production deployments. Provides autoscaling, and fast response times. Azure Machine Learning Compute (amlcompute) Batch inference Run batch prediction on serverless compute. Supports normal and low-priority VMs. Azure Container Instances (ACI) Testing Good for development or testing. Not suitable for production workloads. Azure IoT Edge (Preview) IoT module Deploy models on IoT devices. Inferencing happens on the device. Field-programmable gate array (FPGA) (Preview) Web service Ultra-low latency for real-time inferencing. Train and register a model. Configure and register an image that uses the model. Deploy the image to a compute target. For more information on the concepts involved in the deployment workflow, see Manage, deploy, and monitor models with Azure Machine Learning Service. An Azure subscription. If you don’t have an Azure subscription, create a free account before you begin. Try the free or paid version of Azure Machine Learning service today. An Azure Machine Learning service workspace and the Azure Machine Learning SDK for Python installed. Learn how to get these prerequisites using Create an Azure Machine Learning service workspace. A trained model. If you do not have a trained model, use the steps in the Train models tutorial to train and register one with the Azure Machine Learning service. While the Azure Machine Learning service can work with any generic model that can be loaded in Python 3, the examples in this document demonstrate using a model stored in Python pickle format. For more information on using ONNX models, see the ONNX and Azure Machine Learning document. Time estimate: Approximately 10 seconds. For an example of registering a model, see Train an image classifier. For more information, see the reference documentation for the Model class. Deployed models are packaged as an image. The image contains the dependencies needed to run the model. For Azure Container Instance, Azure Kubernetes Service, and Azure IoT Edge deployments, the azureml.core.image.ContainerImage class is used to create an image configuration. The image configuration is then used to create a new Docker image. When creating the image configuration, you can use either a default image provided by the Azure Machine Learning service or a custom image that you provide. execution_script Specifies a Python script that is used to receive requests submitted to the service. In this example, the script is contained in the score.py file. For more information, see the Execution script section. runtime Indicates that the image uses Python. The other option is spark-py, which uses Python with Apache Spark. conda_file Used to provide a conda environment file. This file defines the conda environment for the deployed model. For more information on creating this file, see Create an environment file (myenv.yml). For an example of creating an image configuration, see Deploy an image classifier. For more information on uploading images to an Azure Container Registry, see Push your first image to a private Docker container registry. The execution script receives data submitted to a deployed image, and passes it to the model. It then takes the response returned by the model and returns that to the client. The script is specific to your model; it must understand the data that the model expects and returns. For an example script that works with an image classification model, see Deploy an image classifier. init(): Typically this function loads the model into a global object. This function is run only once when the Docker container is started. run(input_data): This function uses the model to predict a value based on the input data. Inputs and outputs to the run typically use JSON for serialization and de-serialization. You can also work with raw binary data. You can transform the data before sending to the model, or before returning to the client. The azureml.contrib namespace changes frequently, as we work to improve the service. As such, anything in this namespace should be considered as a preview, and not fully supported by Microsoft. Once you have created the image configuration, you can use it to register an image. This image is stored in the container registry for your workspace. Once created, you can deploy the same image to multiple services. Time estimate: Approximately 3 minutes. Images are versioned automatically when you register multiple images with the same name. For example, the first image registered as myimage is assigned an ID of myimage:1. The next time you register an image as myimage, the ID of the new image is myimage:2. For more information, see the reference documentation for ContainerImage class. Azure Kubernetes Service (AKS) Web service (Real-time inference) Good for high-scale production deployments. Provides autoscaling, and fast response times. Azure ML Compute Web service (Batch inference) Run batch prediction on serverless compute. Supports normal and low-priority VMs. Azure Container Instances (ACI) Web service (Dev/test) Good for development or testing. Not suitable for production workloads. Cross-origin resource sharing (CORS) is not currently supported when deploying a model as a web service. The examples in this section use deploy_from_image, which requires you to register the model and image before doing a deployment. For more information on other deployment methods, see deploy and deploy_from_model. You need to quickly deploy and validate your model. ACI deployment is finished in less than 5 minutes. You are testing a model that is under development. To see quota and region availability for ACI, see the Quotas and region availability for Azure Container Instances document. Time estimate: Approximately 5 minutes. For more information, see the reference documentation for the AciWebservice and Webservice classes. To deploy your model as a high-scale production web service, use Azure Kubernetes Service (AKS). You can use an existing AKS cluster or create a new one using the Azure Machine Learning SDK, CLI, or the Azure portal. Creating an AKS cluster is a one time process for your workspace. You can reuse this cluster for multiple deployments. If you delete the cluster, then you must create a new cluster the next time you need to deploy. Decisions to scale up/down is based off of utilization of the current container replicas. The number of replicas that are busy (processing a request) divided by the total number of current replicas is the current utilization. If this number exceeds the target utilization, then more replicas are created. If it is lower, then replicas are reduced. By default, the target utilization is 70%. Decisions to add replicas are made and implemented quickly (around 1 second). Decisions to remove replicas take longer (around 1 minute). This behavior keeps idle replicas around for a minute in case new requests arrive that they can handle. For more information on setting autoscale_target_utilization, autoscale_max_replicas, and autoscale_min_replicas, see the AksWebservice.deploy_configuration reference. Creating the AKS cluster is a one time process for your workspace. Once created, you can reuse this cluster for multiple deployments. If you delete the cluster or the resource group that contains it, then you must create a new cluster the next time you need to deploy. For provisioning_configuration(), if you pick custom values for agent_count and vm_size, then you need to make sure agent_count multiplied by vm_size is greater than or equal to 12 virtual CPUs. For example, if you use a vm_size of "Standard_D3_v2", which has 4 virtual CPUs, then you should pick an agent_count of 3 or greater. Time estimate: Approximately 20 minutes. For more information, see the reference documentation for the AksWebservice and Webservice classes. Azure ML compute targets are created and managed by the Azure Machine Learning service. They can be used for batch prediction from Azure ML Pipelines. For a walkthrough of batch inference with Azure ML Compute, read the How to Run Batch Predictions document. Project Brainwave makes it possible to achieve ultra-low latency for real-time inferencing requests. Project Brainwave accelerates deep neural networks (DNN) deployed on field-programmable gate arrays in the Azure cloud. Commonly used DNNs are available as featurizers for transfer learning, or customizable with weights trained from your own data. For a walkthrough of deploying a model using Project Brainwave, see the Deploy to a FPGA document. First ensure the necessary dependencies for the inference-schema package are included in your env.yml conda environment file. This example uses the numpy parameter type for the schema, so the pip extra [numpy-support] is also installed. Next, modify the score.py file to import the inference-schema packages. Define the input and output sample formats in the input_sample and output_sample variables, which represent the request and response formats for the web service. Use these samples in the input and output function decorators on the run() function. After following the normal image registration and web service deployment process with the updated score.py file, retrieve the Swagger uri from the service. Requesting this uri will return the swagger.json file. For more information, see the reference documentation for the Webservice class. To test a web service deployment, you can use the run method of the Webservice object. In the following example, a JSON document is set to a web service and the result is displayed. The data sent must match what the model expects. In this example, the data format matches the input expected by the diabetes model. The webservice is a REST API, so you can create client applications in a variety of programming languages. For more information, see Create client applications to consume webservices. An Azure IoT Edge device is a Linux or Windows-based device that runs the Azure IoT Edge runtime. Using the Azure IoT Hub, you can deploy machine learning models to these devices as IoT Edge modules. Deploying a model to an IoT Edge device allows the device to use the model directly, instead of having to send data to the cloud for processing. You get faster response times and less data transfer. Azure IoT Edge modules are deployed to your device from a container registry. When you create an image from your model, it is stored in the container registry for your workspace. The information in this section assumes that you are already familiar with Azure IoT Hub and Azure IoT Edge modules. While some of the information in this section is specific to Azure Machine Learning service, the majority of the process to deploy to an edge device happens in the Azure IoT service. If you are unfamiliar with Azure IoT, see Azure IoT Fundamentals and Azure IoT Edge for basic information. Then use the other links in this section to learn more about specific operations. A development environment. For more information, see the How to configure a development environment document. An Azure IoT Hub in your Azure subscription. A trained model. For an example of how to train a model, see the Train an image classification model with Azure Machine Learning document. A pre-trained model is available on the AI Toolkit for Azure IoT Edge GitHub repo. To deploy an IoT Edge module to your device, Azure IoT needs the credentials for the container registry that Azure Machine Learning service stores docker images in. Go to your Azure Machine Learning service workspace and select Overview. To go to the container registry settings, select the Registry link. 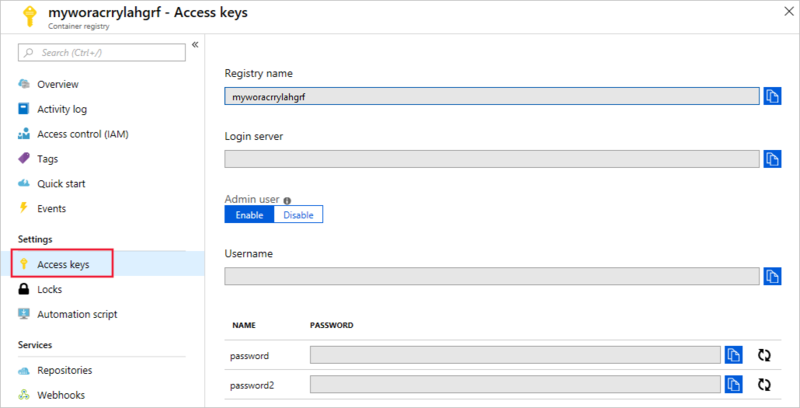 Once in the container registry, select Access Keys and then enable the admin user. Save the values for login server, username, and password. container_url = "\"" + image.image_location + "\","
Save the values for ContainerURL, servername, username, and password. These credentials are necessary to provide the IoT Edge device access to images in your private container registry. Register your device with Azure IoT Hub, and then install the IoT Edge runtime on the device. If you are not familiar with this process, see Quickstart: Deploy your first IoT Edge module to a Linux x64 device. To deploy the model to the device, use the registry information gathered in the Get container registry credentials section with the module deployment steps for IoT Edge modules. For example, when Deploying Azure IoT Edge modules from the Azure portal, you must configure the Registry settings for the device. Use the login server, username, and password for your workspace container registry. You can also deploy using Azure CLI and Visual Studio Code. To delete a deployed web service, use service.delete(). To delete an image, use image.delete(). To delete a registered model, use model.delete(). For more information, see the reference documentation for WebService.delete(), Image.delete(), and Model.delete().